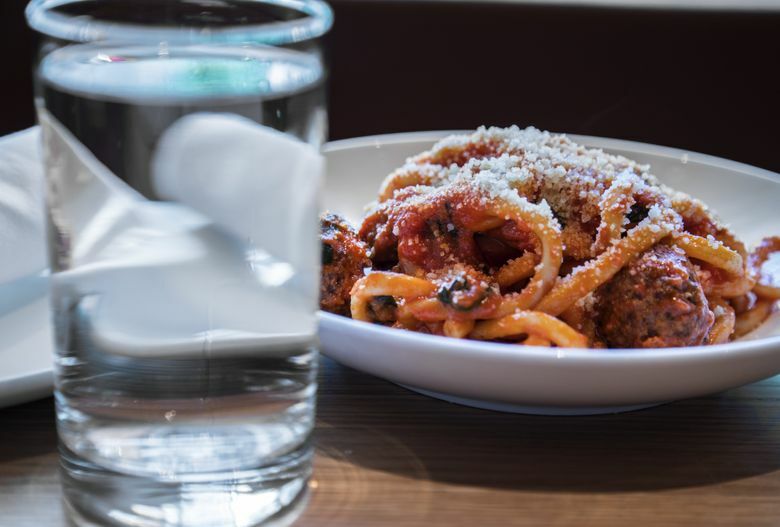 In the heart of downtown, Cortina chooses from Ethan Stowell’s well-established band of Italian favorites, serving pizza and pasta, as well as lavish dishes like steaks and seafood towers. “Have you ever been to an Ethan Stowell restaurant?” It’s a question I heard servers ask frequently at Cortina. Most often, customers answered yes. 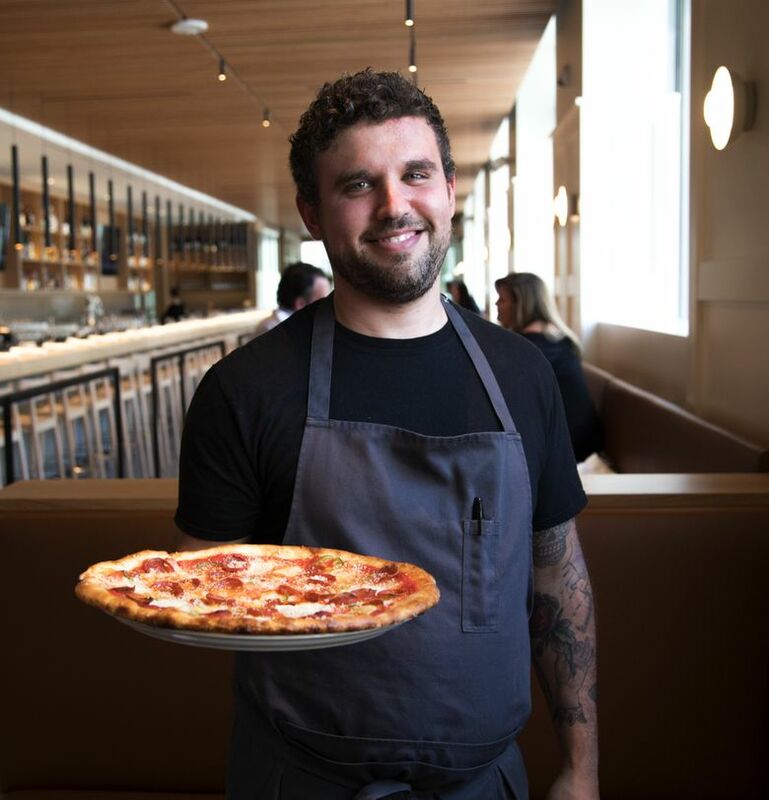 That they ask at all indicates what an established brand name Ethan Stowell has become since he opened his first restaurant 15 years ago at the age of 29. For the record, Ethan Stowell restaurants currently number 16. About half skew Italian (Staple & Fancy, Tavolata, Rione XIII and others). They tend to be intimate places anchored in neighborhoods. Cortina breaks the mold. Encompassing 8,000 square feet at the foot of the Union Square towers in the heart of downtown, it is less a destination than a way station — a modern, metropolitan roadhouse for an expanding, diverse populace. What better bait for the working masses than pizza and pasta? 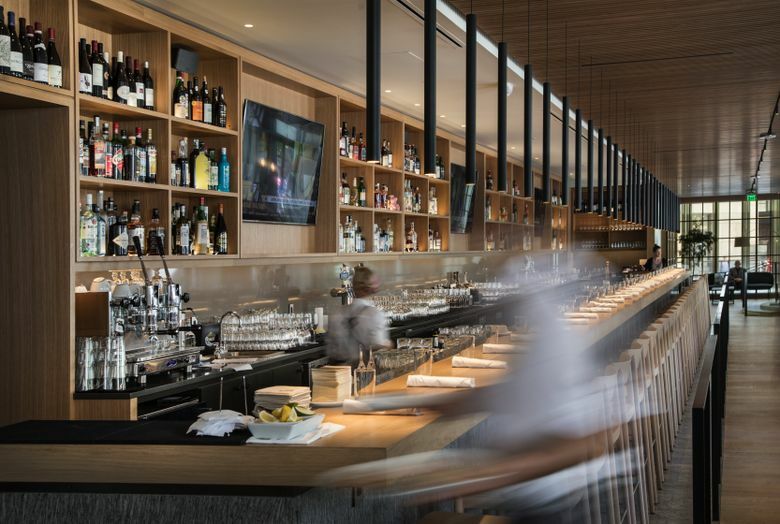 What better lure for vacationing cruisers, conventioneers or corporate titans than flashy steaks, an opulent seafood tower and a 64-foot bar stocked with high-end spirits? Cortina aims to reel them all in, and it has the space. The bar and lounge seats roughly a hundred. The dining room holds 60. Beyond it is a 40-seat private room, concealed behind a paned-glass wall of one-way mirrors. (You can’t see in, but they can see out.) The design by Heliotrope Architects, the local firm behind such diverse projects as Bateau, Joule and Café Juanita, is open and angular, warmed by the lavish use of pale oak on the floor, tabletops, banquettes, bar top and even the bottom-lit shelves of the bar back. The look is utilitarian, but the food — a compilation of Stowell’s greatest hits — has soul. The pizza dough proofs for three days. On the fourth day, it becomes a thin crust that is neither too floppy, nor too crisp, but full of flavor. Go plain with the Margherita, go fussy with wild mushrooms and truffle, or go “Staple and Fancy” with a sweet-hot triangulation of pineapple, pepperoni and jalapeño. I doubt you can go wrong. The six-slice pizzas are ample enough to share. Plan on sharing pasta, too, especially the richer and more robust among them: plump, tender potato gnocchi, for example, dusted with the ash of a charred onion and tossed with fava beans, slivers of smoked geoduck and finely shaved porcini; or tonnarelli, whether cacio e pepe (with pecorino and cracked pepper) or carbonara. The carbonara had an egg yolk nesting in its long, thick strands. You toss the pasta at the table, and the egg becomes a silky sauce flavored with crisp bits of guanciale and cheese, though mine was short on Parmigiano-Reggiano. All the pasta is made fresh daily in a central commissary in Sodo. The extruded noodles mix semolina and Italian 00 flour, giving them a distinctive tension and chew. They are uniformly firm to the bite — in the case of paccheri, smooth tubes that look like jumbo rigatoni, a little too firm for me. Cutting them down to bite-size required considerable pressure with the side of fork, but what a glorious sauce. Chunks of wild Gulf prawns in a sunny amalgam of tomato, fennel and lemon zest conjured the Amalfi coast, while zesty beef-and-ricotta meatballs with bucatini took me back to my Sicilian grandmother’s dinner table — though I doubt she used bone marrow, as they do here, to enrich the tomato and basil sauce. Marrow mavens, take note: A six-inch marrow bone accompanies the inch-thick N.Y. strip from Double R Ranch. Mine was carefully cooked to medium rare with impressive marbling throughout. Topping 12 ounces, it’s sizable enough to split, making the $52 price more approachable for those not on the company dime. A bunker of fries separated the meat from the bone. A sharp, briny salsa verde cut through the rich marrow as effectively as a knife carved the steak. What more could a meat-and-potato person want? A spoon to scrape the marrow would have been helpful, especially as it hadn’t fully separated from the bone. Wild king salmon was impeccably cooked, but if you really want to impress someone, order the shellfish tower. Offered in two sizes (small $95/large $175), even the small one is grand. 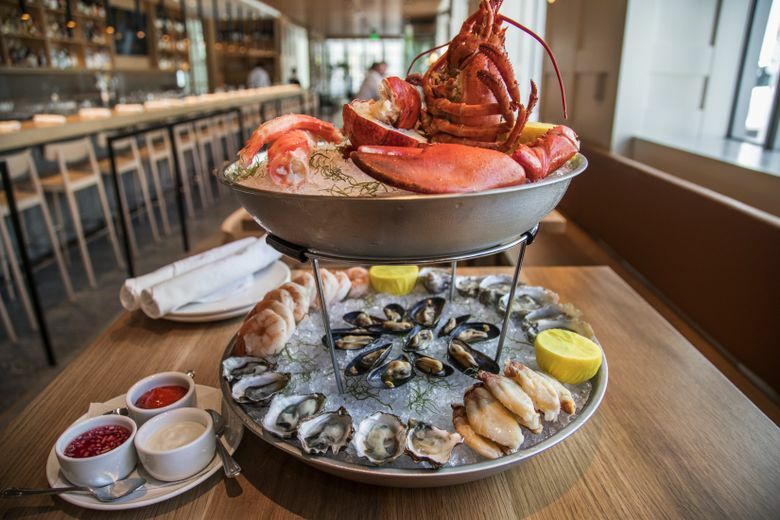 Arranged on two iced tiers, the bounty includes a whole cracked and split lobster; lots of Dungeness crab leg meat and two king crab legs, removed from the shells; a dozen raw oysters; a dozen steamed Mediterranean mussels; eight large shrimp; and three sauces — cocktail, aioli and red-wine mignonette. Four or five people could make that small tower a meal with a few added sides. My suggestions: roasted beet salad with tangy avocado mousse and lemon-drizzled crabmeat (because there’s no such thing as too much crab); rosy slices of speck ham or fat, grilled asparagus; hamachi crudo embellished with cucumber, basil and (for now) Bing cherries; or arancini, deep-fried rice balls enriched with oxtail. For a happy ending, try the exemplary tiramisu, the lovely malted chocolate budino (pudding with crunchy beads of chocolate on top) or affogato — hazelnut gelato and orange biscotti with an espresso pour-over. The chocolate-and-pistachio dipped cannoli looked promising, but someone forgot to fill them all the way with orange ricotta cream. Cortina wouldn’t be my first choice for a romantic date night (see mkt, Marine Hardware, How to Cook a Wolf or almost any other Ethan Stowell restaurant), but it’s a good place to unwind, catch up or regroup with your squad — be they clients, co-workers, kids or pals.